Have your final say: How special is Peter Thompson? Striker supreme Peter Thompson was Linfield's matchwinner as they came from behind to beat Coleraine in the JJB Sport Irish Cup final. Thompson scored twice early in the second half and the Blues went on to secure a league and cup double for the third season in succession. Coleraine had taken the lead on 18 minutes with a Paddy McLaughlin shot. 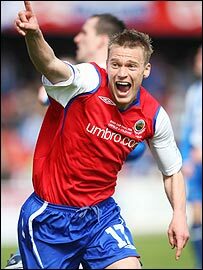 But Thompson, who scored both goals in Linfield's win over Glentoran in the 2006 final, ended thoughts of an upset. The last time a team completed a hat-trick of doubles was 115 years ago, also by Linfield. Just how special is Peter Thompson? But it could all have been so different if Coleraine had taken more of their chances in the first half. The Bannsiders were the better team before the interval and they will feel they should have been more than 1-0 up. Before the goal Mannus made a good save from David Patton as Coleraine found holes in the Linfield defence. Then came the breakthrough score when Marty Hunter's firm header from a left-wing corner was cleared off the line by Aidan O'Kane. The ball fell to defender McLaughlin who drilled a lot shot into the net. With the Bannsiders 1-0 up, Patton had a great chance to make it two when Mannus dropped a long ball but the Coleraine man fired over. John Watt then shot into the side-netting and Tomy McCallion had an effort saved. But the final was turned on its head by Northern Ireland striker Thompson with two goals in four minutes which left Coleraine stunned. The first came in the 49th minute with Thompson getting the better of McLaughlin before delivering a low left-foot finish past David O'Hare. Then he took a pass from Glenn Ferguson to in fire right-footed for his 21st goal in 22 Irish Cup games for the Blues. Thompson had a chance to grab a hat-trick late on but keeper O'Hare saved. Coleraine: O'Hare, Neill, McVey, P McLaughlin, Clanachan, Watt (sub Dooley 74), Hunter, McCallion, Carson, Patton, Tolan. Linfield: Mannus, Lindsay, Murphy, Bailie, O'Kane, Mulgrew, Gault, McAreavey (sub Dickson 45), Kearney (sub Curran 87), Thompson, Ferguson.